Scott Sumner started his now famous blog TheMoneyIllusion in February 2009 it was among other things “to show that we have fundamentally misdiagnosed the nature of the recession, attributing to the banking crisis what is actually a failure of monetary policy”. Said in another way the Federal Reserve was to blame for the Great Recession and there was only one way out and that was monetary easing within a regime of nominal GDP level targeting (NGDP targeting). NGDP targeting is of course today synonymous Scott Sumner. He more or less single-handedly “re-invented” NGDP targeting and created an enormous interest in the topic among academics, bloggers, financial sector economists and even policy makers. The general perception is that NGDP targeting and Market Monetarism got the real break-through in 2013 when the Federal Reserve introduced the so-called Evans rule in September 2012 (See for example Matt Yglesias’ tribute to Scott from September 2012). This has also until a few days ago been my take on the story of the success of Scott’s (and other’s) advocacy of NGDP targeting. However, I have now come to realize that the story might be slightly different and that the Fed effectively has been “market monetarist” (in a very broad sense) since July 2009. Originally Scott basically argued that the Fed needed to bring the level nominal GDP back to the pre-crisis 5% trend path in NGDP that we had known during the so-called Great Moderation from the mid-1980s and until 2007-8. We all know that this never happened and as time has gone by the original arguments for returning to the “old” NGDP trend-level seem much less convincing as there has been considerable supply side adjustments in the US economy. Therefore, as time has gone by it becomes less important what is the “starting point” for doing NGDP targeting. Therefore, if we forgive the Fed for not bringing NGDP back to the pre-crisis trend-level and instead focus on the Fed’s ability to keep NGDP on “a straight line” then what would we say about the Fed’s performance in recent years? Take a look at graph below – I have used (Nominal) Private Consumption Expenditure (PCE) as a monthly proxy for NGDP. If we use July 2009 – the month the 2008-9 recession officially ended according to NBER – as our starting point (rather than the pre-crisis trend) then it becomes clear that in past five years PCE (and NGDP) has closely tracked a 4% path. 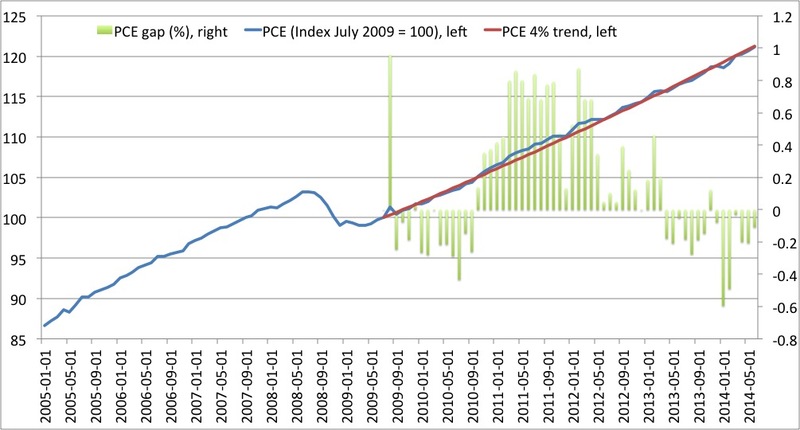 In fact at no month over the past five years have PCE diverged more than 1% from the 4% path. In that sense the degree of nominal stability in the US economy has been remarkable and one could easily argue that we have had higher nominal stability in this period than during the so-called Great Moderation. In fact I am pretty sure that if somebody had told Scott in July 2009 that from now on the Fed will follow a 4% NGDP target starting at the then level of NGDP then Scott would have applauded it. He might have said that he would have preferred a 5% trend rather than a 4% trend, but overall I think Scott would have been very happy to see a 4% NGDP target as official Fed policy. The paradox is that Scott has not sounded very happy about the Fed’s performance for most of this period and neither have I and other Market Monetarists. The reason for this is that while the actual outcome has looked like NGDP targeting the Fed’s implementation of monetary policy has certainly not followed the Market Monetarist game plan. Hence, the Market Monetarist message has all along been that the Fed should clearly announce its target (a NGDP level target), do aggressive quantitative easing to bring NGDP growth “back on track”, stop focusing on interest rates as a policy instrument and target expected NGDP rather than present macroeconomic variables. Actual US monetary policy has gradually moved closer to this ideal on a number of these points – particularly with the so-called Evan rule introduced in September 2012, but we are still very far away from having a Market Monetarist Fed when it comes to policy implementation. However, in the past five years the implementation of Fed policy has been one of trial-and-error – just think of QE1, QE2 and QE3, two times “Operation Twist” and all kinds of credit policies and a continued obsession with using interest rates rates as the primary policy “instrument”. I believe we Market Monetarists rightly have been critical about the Fed’s muddling through and lack of commitment to transparent rules. However, I also think that we today have to acknowledge that this process of trail-and-error actually has served an important purpose and that is to have sent a very clear signal to the financial markets (and others for that matter) that the Fed is committed to re-establishing some kind of nominal stability and avoiding a deflationary depression. This of course is contrary to the much less clear commitment of the ECB. Market Monetarists like to say that the markets are better at forecasting and the collective wisdom of the markets is bigger than that of individual market participants or policy makers and something could actually indicate that the markets from an early point understood that the Fed de facto would be keeping NGDP on a straight line. An example is the US stock market bottomed out a few months before we started to establish the new 4% trend in US NGDP and the US stock markets have essentially been on an upward trend ever since, which is fully justified if you believe the Fed will keep this de facto NGDP target in place. Then we should basically be expecting US stock prices to increase more or less in line with NGDP (disregarding changes to interest rates). Another and even more powerful example in my view is what the currency markets have been telling us. I (and other Market Monetarists) have long argued that market expectations play a key role in the in the implementation of monetary policy and in the monetary policy transmission mechanism. In a situation where the central bank’s NGDP level target is credible rational investors will be able to forecast changes in the monetary policy stance based on the actual level of NGDP relative to the targeted level of NGDP. Hence, if actual NGDP is above the targeted level then it is rational to expect that the central bank will tighten the monetary policy stance to bring NGDP back on track with the target. This obviously has implications for the financial markets. If the Fed is for example targeting a 4% NGDP path and the actual NGDP level is above this target then investors should rationally expect the dollar to strengthen until NGDP is back at the targeted level. And guess what this is exactly how the dollar has traded since July 2009. Just take a look at the graph below. We are looking at the period where I argue that the Fed effectively has targeted a 4% NGDP path. Again I use PCE as a monthly proxy for NGDP and again the gap is the gap between the actual and the “targeted” NGDP (PCE) level. Look at the extremely close correlation with the dollar – here measured as a broad nominal dollar-index. Note the dollar-index is on an inverse axis. The graph is very clear. When the NGDP gap has been negative/low (below target) as in the summer of 2010 then the dollar has weakened (as it was the case from from the summer of 2010under spring/summer of 2011. And similarly when the NGDP gap has been positive (NGDP above target) then the dollar has tended to strengthen as we essentially has seen since the second half of 2011 and until today. 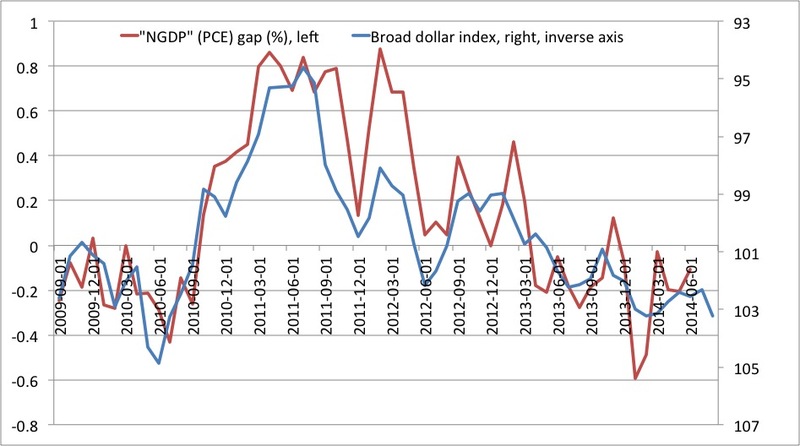 I am not arguing that the dollar-level is determining the NGDP gap, but I rather argue that the dollar index has been a pretty good indicator for the future changes in monetary policy stance and therefore in NGDP. Furthermore, I would argue that the FX markets essentially has figured out that the Fed de facto is targeting a 4% NGDP path and that currency investors have acted accordingly. Just because there has a very clear correlation between the dollar and the NGDP gap in the past five years it is not given that that correlation will remain in the future. A key reason for this is – and this is a key weakness in present Fed policy – that the Fed has not fully recognize that it is de facto targeting a 4%. Therefore, there is nothing that stops the Fed from diverging from the NGDP rule in the future. Recognizing a 4% NGDP level target from the present level of NGDP in my view should be rather uncontroversial as this de facto has been the policy the Fed has been following over the past five years anyway. Furthermore, it could easily be argued as compatible with the Fed’s (quasi) official 2% inflation target (assuming potential real GDP growth is around 2%). In my previous post I argued that the ECB should introduce a 4% NGDP target. The Fed already done that. Now it is just up to Fed Chair Janet Yellen to announce it officially. Janet what are you waiting for? Monetary asphyxiation by Market Monetarism is just a little better than suffocation by the tight-money fanatics. Why not a 6 percent NGDP target for the USA? Growth is good. REAL growth is good. The Fed might of course push up real growth in the short run by increasing nominal GDP growth if there is spare capacity in the economy. However, at the given level of unemployment in the US I doubt that there is much more monetary policy can do to increase real GDP growth. Hence, to me that focus should not be on trying to increase real GDP through monetary policy, but rather on providing nominal stability so a repeat of 2008-9 is avoided. A clear 4% or 5% NGDP level target can do that. Thanks Eric, your paper looks quite interesting. I will have closer look at it.